Premenstrual dysphoric disorder (PMDD) is a medical condition in which a woman undergoes severe depression symptoms, irritability, and tension before menstruation cycle. These symptoms of premenstrual dysphoric disorder are more severe than those seen with premenstrual syndrome (PMS). Some of the major factors playing important role for the PMDD are alcohol or substance abuse, thyroid disorders, being overweight, having a mother with a history of the disorder and lack of exercise. Some of the common symptoms of PMDD are anxiety, out of control feeling, food cravings or binge eating, mood swings with bouts of crying and panic attacks, bloating, breast tenderness, headaches, and joint or muscle pain, problems sleeping, trouble concentrating. Globally increasing awareness and registered cases of PMDD are expected to drive the demand for the PMDD market however regulations over the usage of such medicines in some of the nations and higher R&D cost involved to develop new drugs and treatments is expected to be the key constraints during the period of study. This report identifies the global premenstrual dysphoric disorder market size in for the year 2014-2016, and forecast of the same for year 2021. 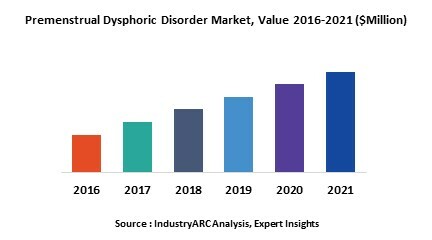 It also highlights the potential growth opportunities in the coming years, while also reviewing the market drivers, restraints, growth indicators, challenges, market dynamics, competitive landscape, and other key aspects with respect to premenstrual dysphoric disorder market. Geographically, North America dominated the premenstrual dysphoric disorder market due to higher awareness about such diseases, higher registered cases due to life style related health issues and well developed healthcare infrastructure. North America was followed by Europe and Asia-Pacific as the second and third largest consumer of premenstrual dysphoric disorder. Asia Pacific is projected to have the fastest growth, owing to rapidly expanding healthcare infrastructure, increasing awareness especially in the major regional economies such as India and China in the region. 13.11. Dr. Reddy’s Laboratories Ltd.